March 23, 2011: Thank You! PAX East deserves a large post, or perhaps a series of posts, with in-depth analysis, lots of photos, and much more. However, I'm just back in the office -- I flew direct from Boston to Las Vegas for the GAMA Trade Show! -- so I wanted to get the most important thing out of the way first: the list of people we need to thank. Thank you, attendees. You responded to our demos with genuine enthusiasm and positive energy. We couldn't have done it without you. As SJ says, "Thank you for playing our silly little games." Thank you, Enforcers. You were, as always, ready and willing to do your jobs with a degree of professionalism you don't always see in professionals, let alone volunteers (as you are). Thank you, Father Fletch. 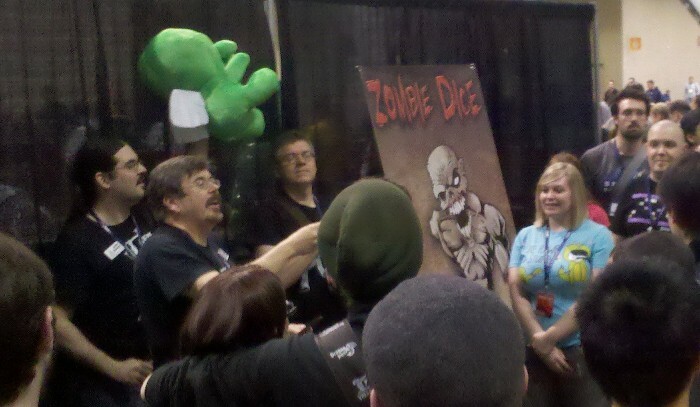 Your leadership of the TableTop area and promotion of gaming in general is nothing short of capital-A Awesome. Thank you, official PAX people! Mike and Jerry started it all, and surrounded themselves with a bunch of brainy folks who work hard behind the scenes. We rarely know their names, much less their faces, but their invisible touch is felt every time a food vendor doesn't run out of hot dogs, every time a television crew shows up, and every time a pallet arrives on time and in the right place. Thank you, G4TV and all the podcasters. SJ's voice (and image!) can be heard on geeky shows such as X-Play, Bald Move, GameSalute, ChattyDM, Evil Avatar, MTVGeek, and more. You're helping to spread the word of Munchkin! Thank you, MIBs. You stood toe-to-toe with a horde of gamers, ravenous for demos, and you were worthy of the challenge! PAX -- both East and Prime -- is a huge amount of work. These people turn that effort into an even greater reward. Thank you!